Maxim Lighting Inca Collection 9-Light pendant fixture in polished chrome finish, features metal construction. The clear/white shade brings elegance to the home. This fixture features nine 40-Watt 4500-Lumens 2900K G9 xenon lamps. It measures 31.5-Inch x 12-Inch x 10-Inch. 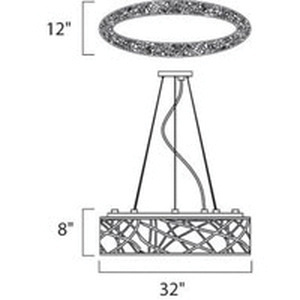 This fixture comes with 130-Inch lead wire for hassle-free installation.